Poupee Girl is a Japanese social networking service (SNS) featured fashion brands. It opened in February 2007, and gained over 300,000 users by March 2009. The 98 % of users are women and 35 % are in foreign countries. Now, you may wonder, what’s so special about this SNS? 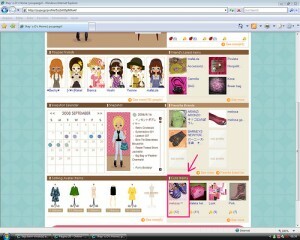 The main attraction of Poupee Girl is that the user can dress up her personalized doll. The user can post the pictures of your actual fashion or cosmetic items and get the virtual money called “ribbon”, which can be exchanged with new items. Also, the user can show what they actually have to other fashionable users and share opinions. You know how women love to show their belongings like clothing, shoes, bags, accessories. Another reason of the popularity is the cute design of the site and the dolls. Poupee Girl NintendoDS game was released on the December 17th, so now younger girls who don’t use computer can enjoy it too!